Going into yesterday’s primaries in Kansas, the big national narrative at play in the Democratic contest to choose a challenger to vulnerable Representative Kevin Yoder was the familiar “Move to the Left” story. Labor lawyer Brent Welder took the blueprint used successfully by Nebraska’s Kara Eastman, who won a May primary in a similarly competitive Republican-held district, and made it a bit louder and prouder. Like Eastman, Welder stands for the proposition that Democrats have been losing to conservative Republicans in the heartland not because they are too liberal, but because they are too timid, moderate, and corporate-subservient. Indeed, this quote from Welder is a good two-sentence distillation of the lefty take on Democratic ideology in the Midwest dating back to Tom Frank’s seminal 2004 book What’s the Matter With Kansas? [T]here’s the clear trend in Democratic primaries this year: Women are winning the vast majority of competitive races. 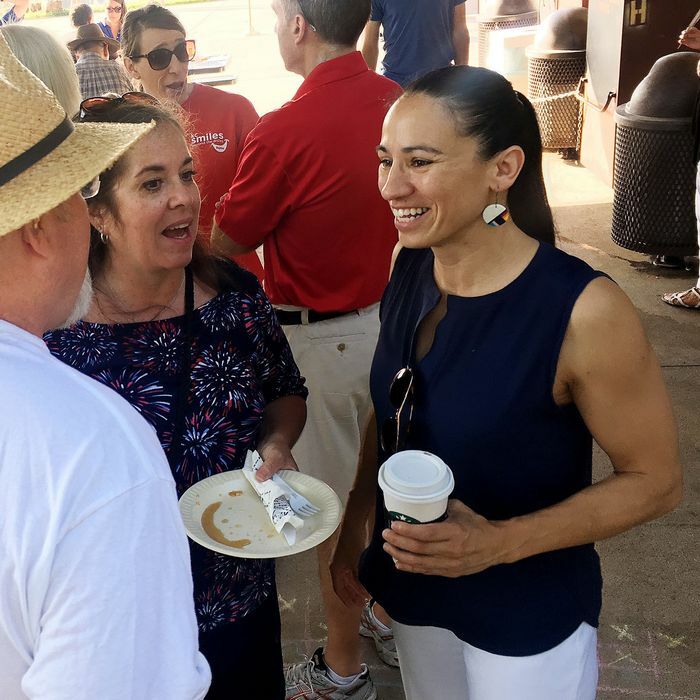 If that trend extends to Kansas, the likely beneficiary would be Sharice Davids – a former White House fellow and former professional mixed martial arts fighter who will become the first openly lesbian Native American in Congress if she wins in November. She’s also the daughter of a Army veteran who raised her as a single mom, an Ivy League–educated attorney, and the founder of a coffee company. But there’s only so much biography one can absorb. For purposes of the Third Congressional District of Kansas, Davids was perceived as a moderate alternative to the Sandernista Welder, though another candidate, schoolteacher Tom Niermann, was more conspicuously centrist. But the publicity gained by the Sanders and Ocasio-Cortez appearances probably helped frame Davids’s less ideological message favorably. It also didn’t hurt that EMILY’s List endorsed her and spent enough money on her behalf to offset Welder’s successful small-dollar fundraising. Welder also had a bit of a carpetbagger problem, having just moved to the state and district last year from St. Louis; Davids is a native Kansan. If only because of her unusual background and identity, Davids is going to be an attention-magnet between now and November. And the handicappers appears to think she is very viable against Yoder, whose own primary performance against two unknowns was not impressive. Projection: Sharice Davids (D) wins Dem primary in #KS03, defeating Brent Welder (D). Faces off against Rep. Kevin Yoder (R) in the fall, who took just 68% in his primary. @CookPolitical rating will be moving from Lean R to Toss Up. This is a district narrowly carried by Hillary Clinton in 2016, so it’s on everybody’s watch lists. With Davids joining a ticket led by state legislator Laura Kelly, the Year of the Democratic Women narrative has gained a bit more heft. But it’s not like Sharice Davids is going to get lost in the crowd.